Our host hotel is the Best Western Plus Arbour Inn and Suites in East Ridge. Please make your reservations as soon as possible to guarantee the best room choices. Best Western Plus features a large parking area for long trailers and car haulers. For reservations at our discounted rate, you must call (423) 893-7979 and mention Bug-a-Palüza Last date to make reservations is April 11th. The Motel 6 at Camp Jordan is also ready to serve you. For reservations at our discounted rate, you must call (423) 894-1417 and mention Bug-a-Palüza. Single car parking only – there is no room for car haulers or trailers at the Motel 6. Room rates are calculated with one person per room. Please add $5 per person occupying room (After 1st person). Camping is available on the show grounds. 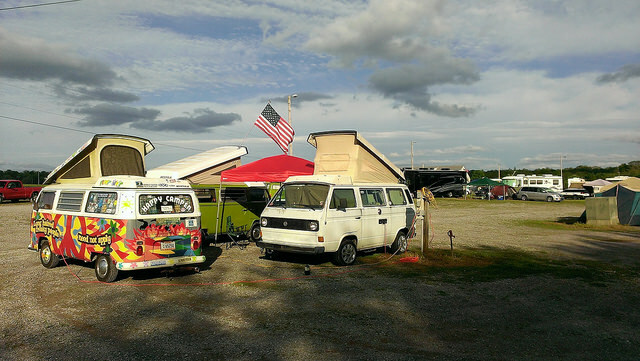 Camp Jordan features a large RV lot with gravel areas for any size RV (excluding 50A) or camper, plus lots of flat, grassy areas for tents and campers. Water and power are available (30A service) so bring long extension cords and splitters. The cost is just $5 per person for the weekend. All camping fees due at the gate upon arrival, there is no pre-registration to camp. Campers wishing to set up before Friday must contact East Ridge Parks and Rec directly to pay additional camping fees. Camping spots on the field are first come, first serve. Water and electricity hookups are available on a limited basis. Bring your own drop cords and water hoses. Electrical hookups are 30A, you may need an adapter. Local noise ordinance must be observed (keep the noise down after 11 PM). All camp and cooking fires must be off the ground. Pets must be on a leash and owners must clean up after them. E-Z UP TENTS AND CANOPIES – Camp Jordan does not allow stakes driven into the asphalt or ballfields. Tents and canopies must be held down with at least 40 lbs. of weight per leg. This is an insurance requirement and will help prevent injury/damage to property due to unpredictable winds. Please bring enough weights for your popup. Improperly weighted tents will be asked to be taken down.